LASER COMPONENTS has introduced coatings, designed for use on optical fiber end faces. With these coatings back reflections are reduced by nearly 3% at the interface between glass and air. The F&E devision has continued to make developments in this area, which has resulted in new standard designs. 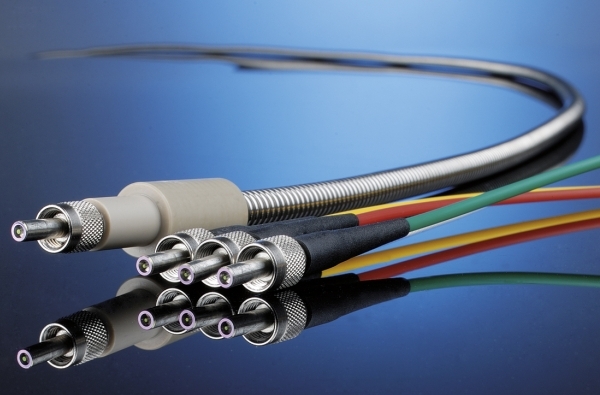 The cables are available with a robust and, yet, flexible metal jacket as a protective covering around the optical fiber. A corrugated tube made of stainless steel and, thus, the best metal jacket available is used. To ensure that the connection between two optical fiber plugs connected by a metal jacket is potential free, vacuum-suitable isolators are mounted on both ends between the plug and the metal jacket. If less robust protective jackets are required, LASER COMPONENTS offers AR-coated fibers which are also available with protective jackets made of Teflon. Naturally, these fibers will also be available as so-called “bare fibers” (i.e., without a protective jacket). The cables are available with SMA connectors or a D-80 plug. Both connectors have a free-standing fiber; the fiber bore hole of said connectors can be adjusted for use with different types of fibers. For very high power, plugs with copper ferrules are recommend.